Is the world really that simple? I was reading a book about genetics, a fictional one of course, I am not the one to read science books and enjoy them unless I know what is being written about. It has put me in a quandry. It talks about life after hundred thousand years, when mankind will be at the teetering point, with global warming at its peak, no food, rising sea levels and a pre-Dark Ages like scenario. The book spoke about a Scientist who tries genetic modification to make humans co-operative and thus eliminate the possibility of fights altogether. 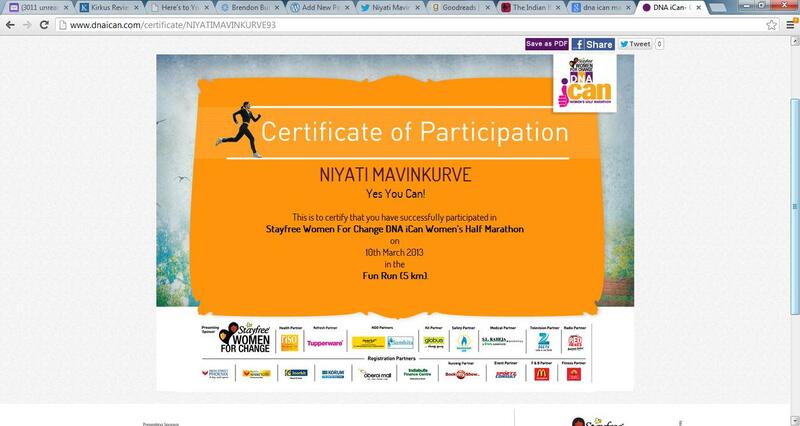 When my mom and sister were registering for the DNA iCan Fun Run for 5 kms, I was skeptical. I doubted if I could do it. And I thought I was too lazy to run, let alone walk for 5 kms. Nonetheless, I registered and thought if I didn’t feel like it, I probably wouldn’t turn up. I don’t remember ever practicing, let alone running in preparation for this. As the date of the marathon came closer, I got excited for some reason. I was looking forward to the marathon. Going and running for 5 kms was a challenge and an exciting one. I selected my dress with a lot of care and tied my hair up with my favourite hair clips. There were a few hearts with glitter and one clip which resembled a beach slip-on. I loved such eccentric hair clips and it had been a while since I’d picked that one out. When we went to BKC, the atmosphere was like a festival. A lot of women had gathered and a lot of men too, to cheer them up. While the D for Dynamic, N for Nutty and A for Awesome chants sound very cliché, it felt really nice to say that. When Akshay Kumar flagged off the Fun Run, I knew I was on to something special. I trotted along and saw my mother and sister disappear into the crowd. I ran and alternated it with walking. When I looked around I could see so many ladies from all walks of life who had come. As they ran and cheered each other up, I realized, they too were here to show that they could. It was a long walk ahead when my mind began wandering and musing. I realized I could do this. Even though my heartbeat was fast, I could handle it. It felt stupendous knowing that I did not even need to push myself, I just did it. I could see I was picking up pace and leaving a lot of ladies behind. I started comparing my speed while I was walking when I realized that this was what I did everyday. I compared myself to so many women, thinking about how pretty they looked and how I needed to push harder to get inside the train. And then it struck me, this was MY MOMENT. It was my race. It was my run. I didn’t need to carry them along. When we reached the half0way mark, I knew I was on to something special. While my heart was pumping blood, it was also pumping a huge sense of achievement. I could see some men running with their better half just to cheer them on and I missed my family in that one moment. I picked up pace and ran as fast as I could towards the last leg of the run. I knew I could do it. The last one kilometer, I must have probably crushed the bottle I had in my hand. But I knew I wanted this moment for long. To run past the finish line and douse myself in water and feel that excitement of having won. Even though there were a lot of women who finished before me, I felt this huge sense of pride. I HAD DONE IT. Inspite of a lot of doubts including a healthy dose of my own, I’d done it. I realized we as a society tend to place so many restrictions on our people. You can’t do this, it just isn’t done this way, it never works out like this. We get so used to doing things the way they are “supposed to be done” that we stop listening to our own hearts. They say the most reassuring sound is the sound of your own heartbeat. That day, my victorious heartbeat drowned out every other sound I could hear. I realized no matter what a crazy nut I was, I was me. I could do whatever I put my mind to. And that even if I made mistakes or made wrong choices or took the wrong path, I’d come to the right path eventually. Having everyone tell me what “should be done” wasn’t making me an ideal daughter, it was making me a subservient person without my own personality.